It's been an intersting few years and sorry that I haven't gotten back to talk to you guys sooner. Rafe and I have been enjoying some down time in New Orleans and honestly it's hard to pull yourself away from your bonded mate. 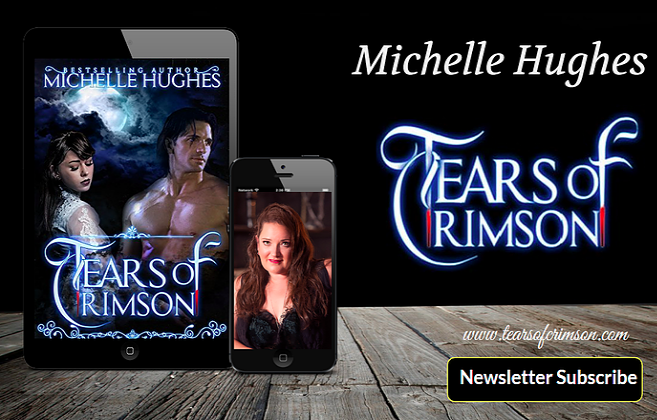 Michelle wanted me to stop in today and explain why the last book for the Tears of Crimson series wasn't available yet. Apparently I'm much better explaining things and since I''ll admit I've been a little selfish lately, it's the least I could do. Rafe and I have been feeding these stories to Michelle over the years because we've come to feel like she's part of our family. There are few humans that we allow into our world and for good reason. We all have one universal law, and that's to keep the supernatural world underwraps. Only in fiction can we reveal the truth about our nature, so we visit certain people in dreams to share our stories. I'm probably already saying too much, and the Elder's have warned me that the thin line we walk is getting thinner by the day. Enough about that. The reason the last book has been delayed is because some new immortals have decided they enjoy Michelle as much as we do. We tend to be a attracted to a certain type of a human and keeping others away, well that's easier said than done. Apparently there is another story that crosses lines with ours and Caleb (who'll you'll get to know soon), demanded that we allow this to be told because it could very well change the outcome of our immortal lives. Beleive me, we're not any happier about this than the readers of the Tears of Crimson series. Unfortunately when Caleb speaks, we all have to give in to his demands. We don't know everything he's sharing with Michelle. If nothing else Caleb enjoys his games. All I can really tell you is that the series will be titled Call of Souls and apparently the entire human race is on the line. Rumors have been going around that he's finally found his bonded mate, and being a vampire doesn't mean that I don't still have feelings for my former kind, so she has my sympathy there. He's definitely a looker, I'll give him that, but his superiority complex makes the vamps I hang around look like gentlemen. According to Rafe I need to stop talking about him, so I'll end that topic for now. Anyway, I look forward to seeing you guys soon. I'm not sure how long Caleb plans on tormenting Michelle before she finishes this project, but knowing his ego he won't wait too long. Until then, if you haven't picked up some of the other books by our indebted human, be sure to check them out. Since we've spent so much time consuming her thoughts it's only right that she enjoy some of the fruits. Until later.